Exterior | House by the water. With the benefit of Instagram filters. Having just survived a sleepover party for six almost-10-years-old girls, the only thing I can do this afternoon is laze on the sofa. 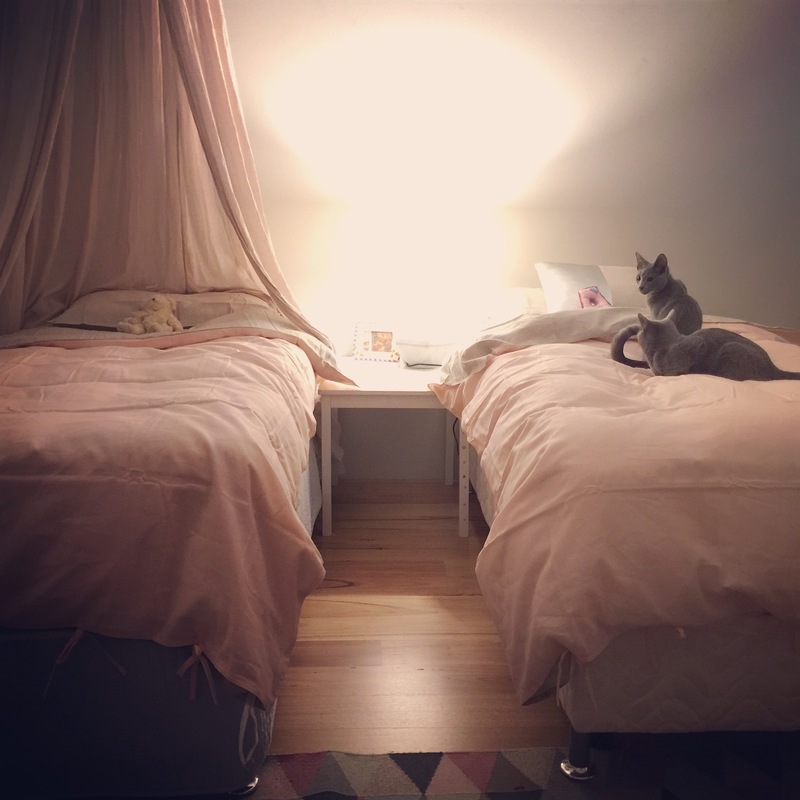 The second Little Pig and I glammed up her room a bit with some matching doona covers. I ordered them online since I’ve had no time to shop. That was a mistake. While the doonas themselves are quite lovely, they are not the colour that they appear online (nor in the hard copy advertising of the product sent along with my order). So the various pinks in the room clash. New doona cover, modelled by Evita. The Nice Wolf says I should have learned by now. Helpful. I’ll probably do it again. I’m afraid I’ve developed shop snobbery, an unpleasant side effect of several years of online interiors “research”. There’s only one local shop that satisfies my snobbery, so if I can’t find it at Frisky Deer, I look online. There is the argument that buying better quality products than the average Kmart product may pay off in the long term, but when it comes to bed linen I’m not sure that it’s true. I pick on Kmart because I recently got all excited over Kmart’s new industrial style lockers. Just what I was searching for to put in my son’s room. The excitement ended as soon as I saw the product, so small and looking as though it would barely make the trip home let alone stand up to the hardship of housing a 6 year old boy’s daily clothes. Shop snobbery is an expensive addiction that I’m trying to control. To curb my habit, I’ve taken up some DIY. Inspired and instructed by Maya from House Nerd, I dared to drill a hole in a brand new wall. At first, I thought I was no good at it, but then Nice Wolf replaced my inferior drill piece included in a kit, with a decent drill piece and away I went. I was on a roll with 3 wall hooks mounted, only to be halted by some electric wires. According to my wire detector, my whole wall around my bed head is filled with electric wires! Exactly where I want to put a bracket for my much-loved pendant light. Back to the drawing board. Not to be defeated, I took up rendering. With a couple of YouTube lessons and some advice from the Nice Wolf under my belt, I set about to hide the neighbour’s brick fence. The Nice Wolf made me a concrete mix in the mixer. He was laying cobblestones (forever….) while I rendered the wall. I donned some gloves, put the grouting gizmos (technical term) in my hands and hoped for the best. Looking like I know what I’m doing. I am not a perfectionist. Some may shiver at my amateur efforts, but I am rather pleased with this wall so far. I plan to paint the wall once the rainy days disappear, then plant a row of pleached pears or lilly pillies in front. The professional landscapers installed our outdoor lights. They look WOW! They bloody well should, too. (Dad, cover your eyes…) They cost $7000, or about $500 a pop, on average. My night time photography is blah, but trust me that my 3 coastal banksias, lit up at night, look fantastic and as for the copper step lights? See for yourself. We are, as always, progressing slowly. I really, really, really hope that next time I blog, our landscapers, Tim Davis Landscaping, will be finished their scope of work. They still have the pool to finish, a couple of fences to install, a bench seat to deck and a few bits of tidying up to go. Honestly, they’ve been incredibly slow. I can’t blame them in this rainy weather, but they did start last December. It’s bloody freezing outside. I’m sure our weekend weather comes from the Antarctic. (I’ve not had a winter for several years, so I may be a little sensitive.) The Nice Wolf is tough! And handy. And is currently outside working on step pavers and cobblestones through squalls of rain and chilling wind. He’s on a schedule. The professional landscapers are yet to install our garden lights and the roller door which covers some outdoor storage beside the canal. To complete these two jobs, they need us to complete the step paving which houses step light canisters and the section of cobblestone paving around the storage area. Of course, by “us”, I really mean The Nice Wolf. These are both seriously slow jobs. The steps have to be done step by step, literally. There is concrete carting and setting time involved and some fiddly circular holes to be made for the light canisters. Perhaps a professional might knock the job off in a day, but for my weekend warrior, it is taking more than a few weekends. Never-the-less, he’s getting there and his labour is free. The landscaping is slowly progressing. The outdoor tiles around the pool area have been completed and we have a fence and gate installed to restrict access from our front yard. We went for a cheap option for this side of the pool fence. We may alter this area to include a covered outdoor kitchen a few years down the track, in which case, the fence will go. In the meantime, I’ll cover it up with some creepers on the poolside. I’ve been itching to get started on the planting. I need to be patient and wait for the hardscaping to be done. The longer I have to wait, the more I change my mind. I’m oscillating between choosing a frangipani or an olive tree as our feature tree. On one hand I love the colour of the olive leaves for our colour scheme, on the other hand, the frangipani’s sculptural trunk and branches are hard to beat. Lomandra, coastal banksia and a native ground cover. I snuck in a few extra plants which made me very happy. What can be better than gardening beside the water? My coastal banksias were looking lonely, so I planted a row of lomandra and a row of native ground cover either side of the trees. I popped in a few ground cover plants around my kangaroo paws too, to create a bit of interest and try to limit weed growth. Six months since handover past and I sent my list of items requiring attention to the builder. There was nothing of great significance on the list and I’m pleased to report that most of the items were quickly fixed with a minimum of fuss and tradie visits involved. I will do a full review of our builders, Webb and Brown-Neaves, sometime soon, but I must give them a pat on the back at this point for making the “six-month maintenance stage” fairly painless. Our ensuite. Simple, spacious and lovely! Finally, a little “HELLO” to the House By The Water tourists! We’ve been getting people stopping in their cars outside our house to take photos. Some are braver than others and say “hi”. I love that one lady this week asked if she could hold her tile (that she happened to have in the car) up against our paintwork. That’s totally something that I would have done! How cabinets made my day. Fearing another slow week, I decided to trial a new strategy to keep work progressing rapidly at House By The Water. Bribery. Our builders, Webb and Brown-Neaves asked me to meet the tiler on site on Monday, so first thing in the morning I left the tiler a box of chocolates hoping it would make him work at his best. I know that the tiling is a big job and a critical one in the pathway to the builders handing over the keys on December 18th. Well I’m not sure that it had the desired effect, (any tilers reading, please send in your suggestions,) but we do at least now have the bathroom and ensuite screed. Kids bathroom. Note: hole in floor for laundry shute. I collected some render that had fallen to the ground to take to the tile shop. I need to select a tile to cover the top face of the patio awning. I want it to be inconspicuous. A couple of broken windows have been replaced and some interior scaffolding is in place. I hope it means that the painter will start soon. But the highlight of the week is definitely the arrival of the cabinets. My mum sent me a text message during the day…”There’s a large furniture truck outside your house.” Oooooh! Cabinets! Cabinets for the kitchen, scullery, laundry, bathroom and ensuite. Lots and lots of beautiful storage. Jigsaw pieces sitting in the dining room. What a giant puzzle it must be now to put it all together. For those of you who are missing my little chats about interiors, I promise a short break from building talk next week. I’ve been making a few exciting purchases and plans for our interior but I can’t reveal them just yet. I’m so pleased to see the scaffolding gone so the plastering and rendering can progress. The house looks a bit washed out of colour – I think that’ll change with the stack-stone feature column and landscaping. Side view. A bit of scaffolding left for the last little piece of roof to go on. Australia, see you in 3 days! Prepare for photo overload. The first thing I do every morning is check my inbox for photos of House By The Water. 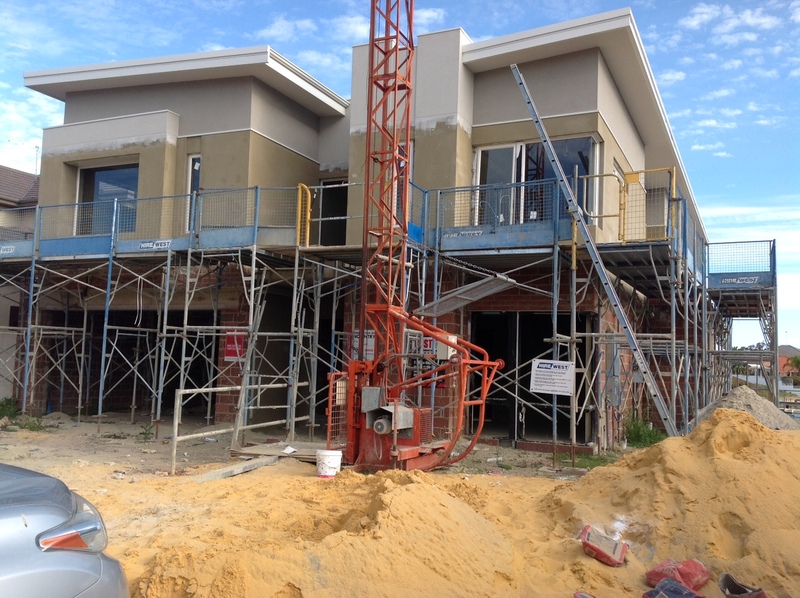 You never know when one of my Mandurah friends might have been in the area and thought to take a photo or when our builders decide it’s time to show off some work. This week I cracked the photo jackpot. My blogging friend, Trixee, was in Mandurah. 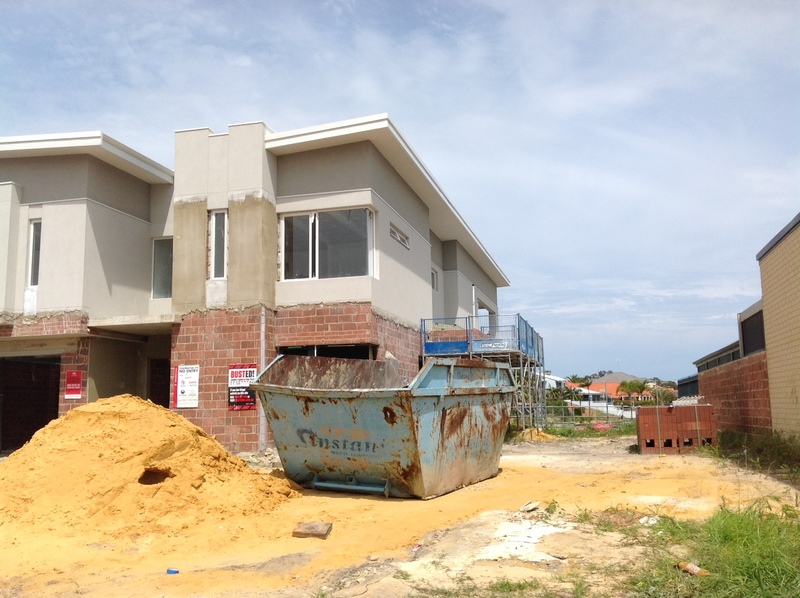 Trixee is building a solar passive home in Perth and knows what a girl wants when it comes to building photos. No detail is too big or small to snap. Aside from evidence of building progress and quality, the photos serve as a record of the location of pipes, wires, holes, etcetera. 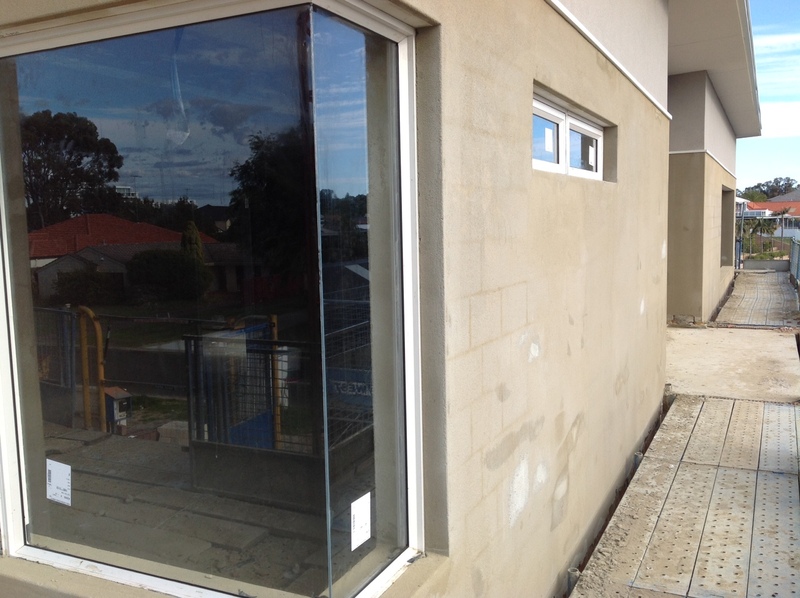 As if Trixee’s photos weren’t exciting enough, our site supervisor sent photos of windows! WINDOWS! 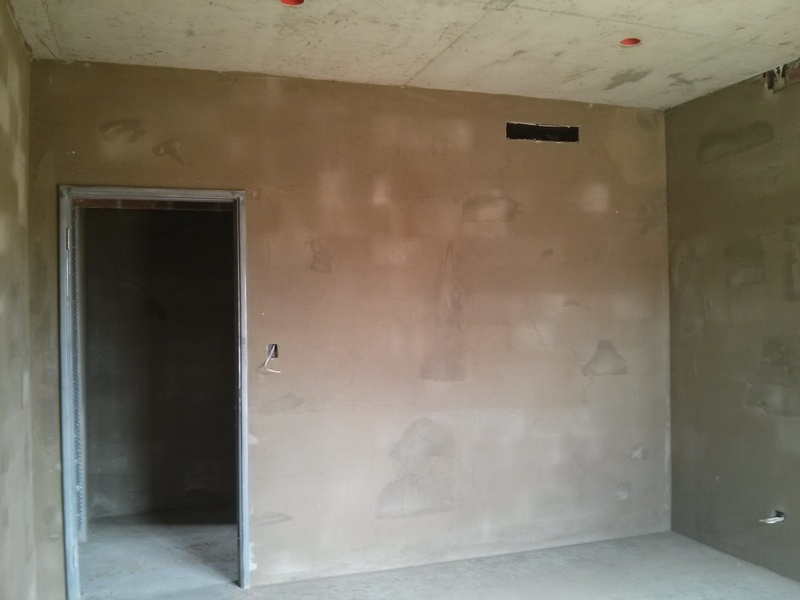 The top floor render is completed and is drying out before being sealed, “textured” and painted. 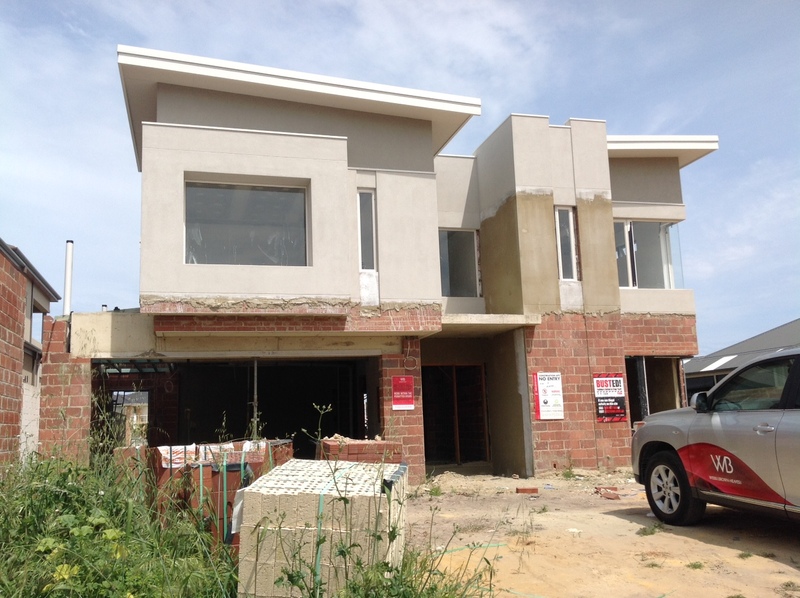 The window frames (in “white lustre”) should blend in with the walls once the render is painted. Some top floor windows are yet to be measured up on site. Coming soon! 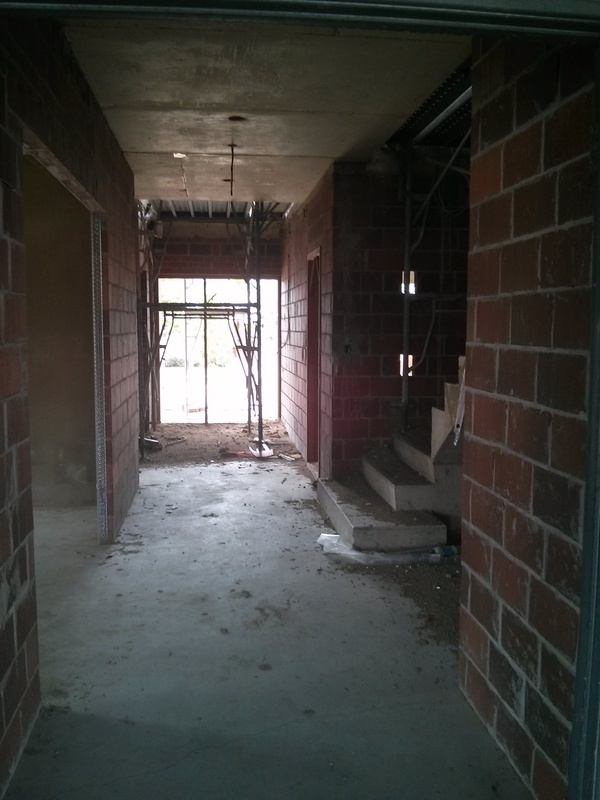 Left to right: linen closet, stairs (scaffold covered), master bedroom (in distance), living area. 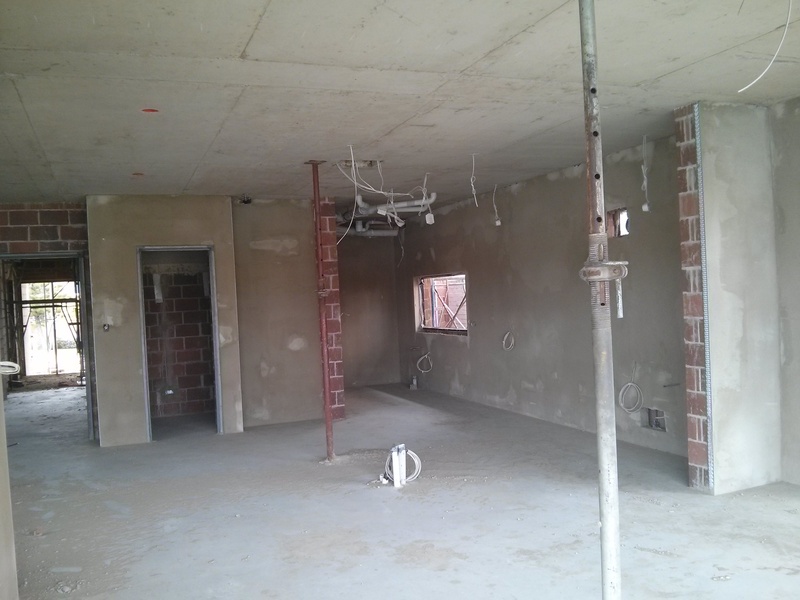 Upstairs the rendering is complete, the ceilings and cornices are in. 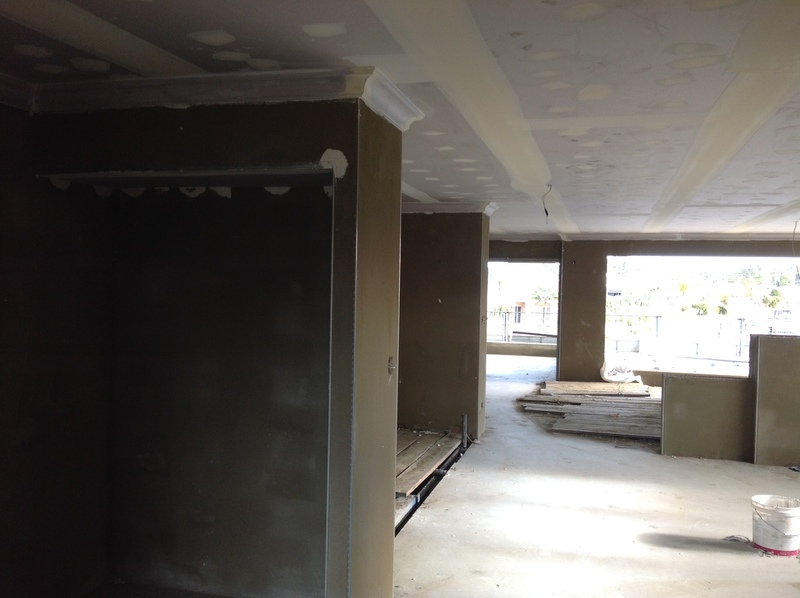 Ready for sanding the ceilings and white-setting the walls. Looking rather dark, but not for long. 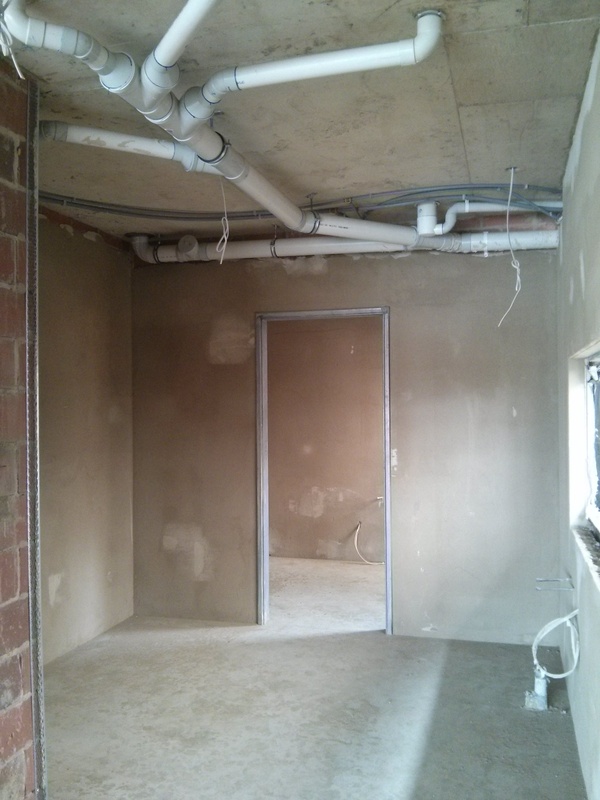 Scaffolding currently covers the entrance void space and light grey walls will make all the difference. The library opening is to the left. Bedroom for the littlest pig. Scullery. My mess hiding indulgence. Home to sinks, dishwasher, fridge, microwave, pantry and more. From the dining room, looking into the kitchen. Scullery at right rear, “cellar” through the door. 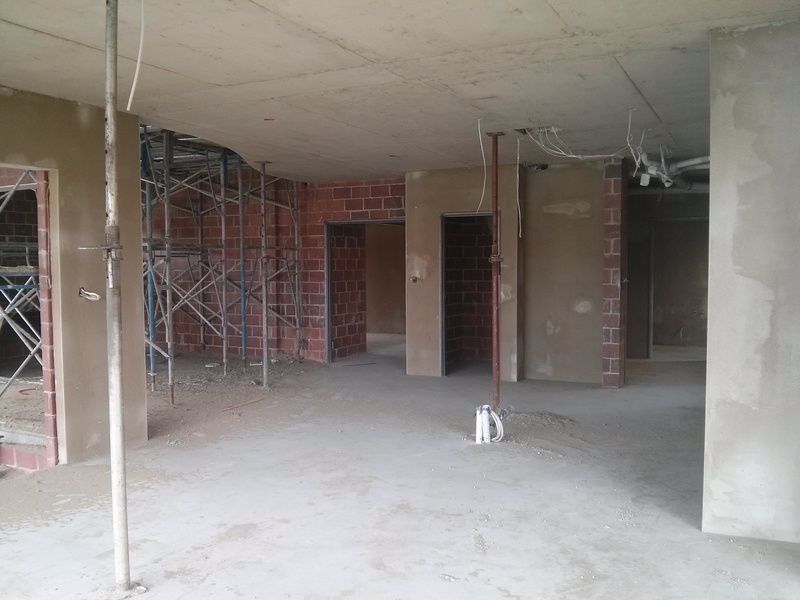 From the dining room, looking across the kitchen to the living area on the left (still housing a lot of scaffold to cover the void). 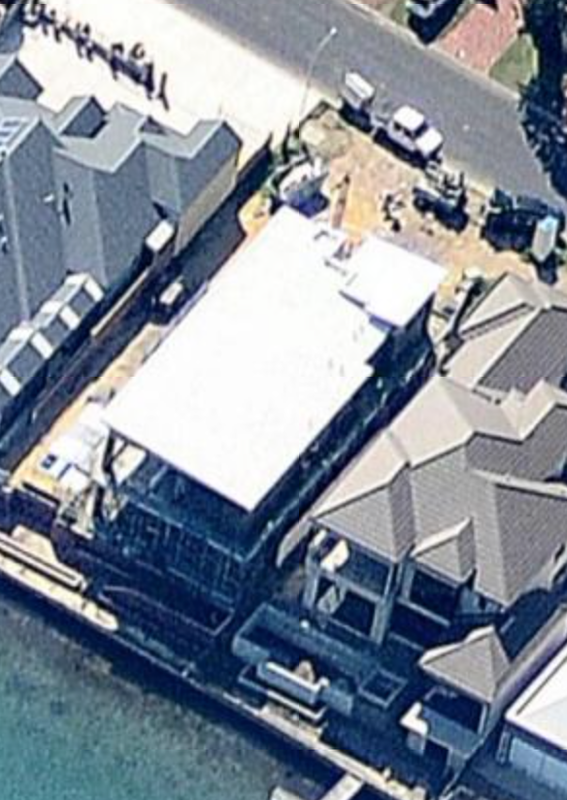 To top it all off, Nearmap published another aerial view of our property – the first time they’ve flown over since December. There’s not much to see now that there is a gigantic roof on top, but you can see the difference in style of our house compared to a typical house in our area. I hope the neighbours are not cringing! Canal side view. Work in progress. House building packages should come with counselling. You know, the “Build Well value pack”. It includes internal painting, floors, air conditioning and 4 sessions with a qualified psychologist. Sunday night, I was a little bit grumpy. The cause? The weather App on my phone. 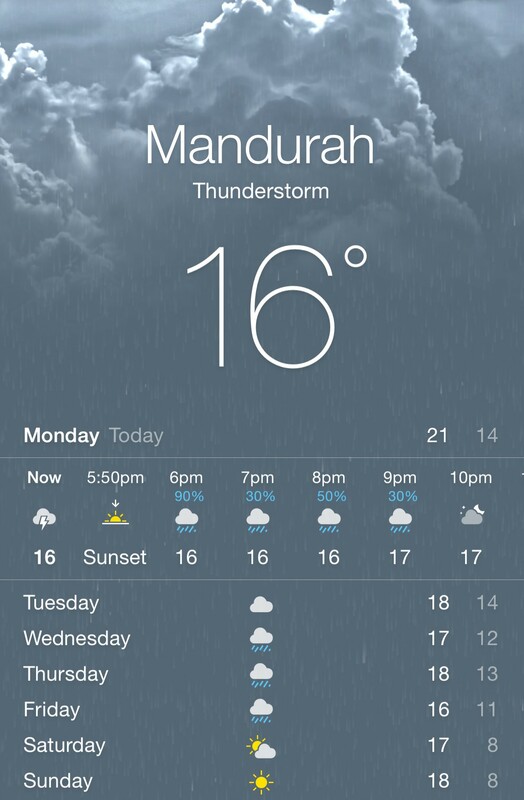 I had visions of the tradies staying at home all week, Ugg boots on, watching reruns of “Real Tradies of Melbourne”. Special program for Tradies National Health Month. Fortunately, I woke the next morning to fresh photos of work at House By The Water and a plan for the week that didn’t revolve around weather. So I’ve postponed my session on the therapy couch for another time. 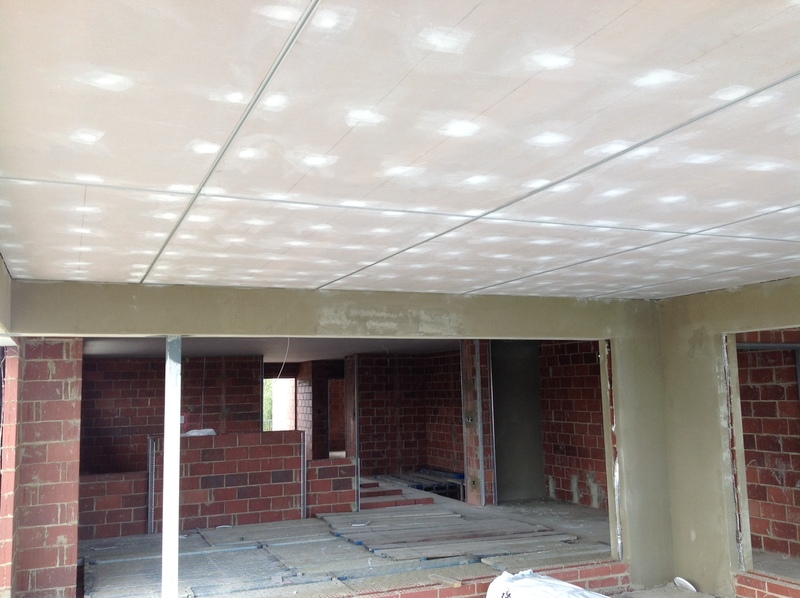 Plasterboard ceiling and a small amount of internal render started. I have been waiting for this bit. 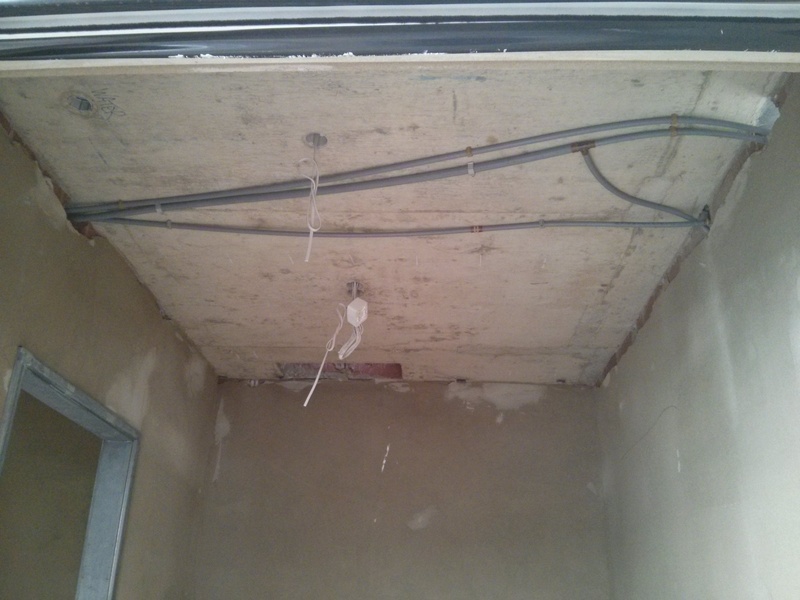 The ceiling makes all the difference between a construction site and a future home. The light suddenly changes and you get a sense of the room proportions. 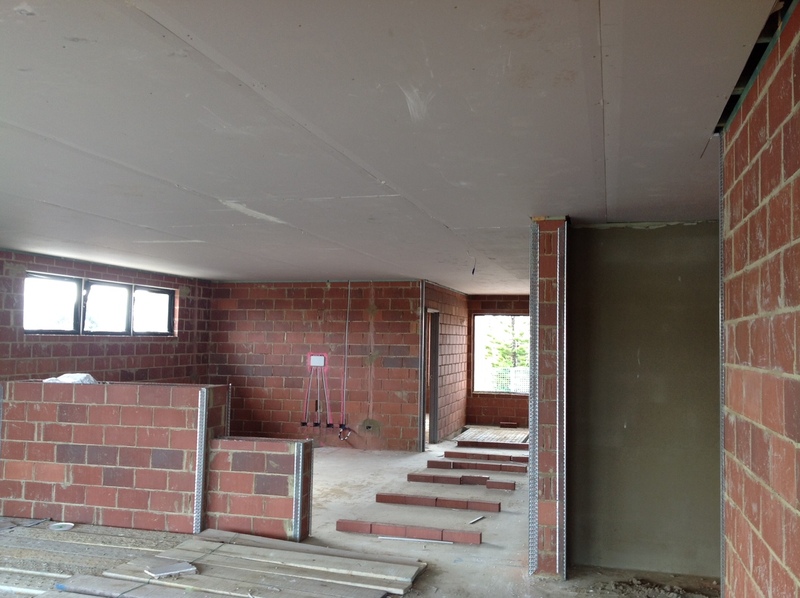 The internal render on the top floor should be completed this week. (Writer’s déjà vu.) Then the ceiling fixers can return to flush the joints and put the cornice up. 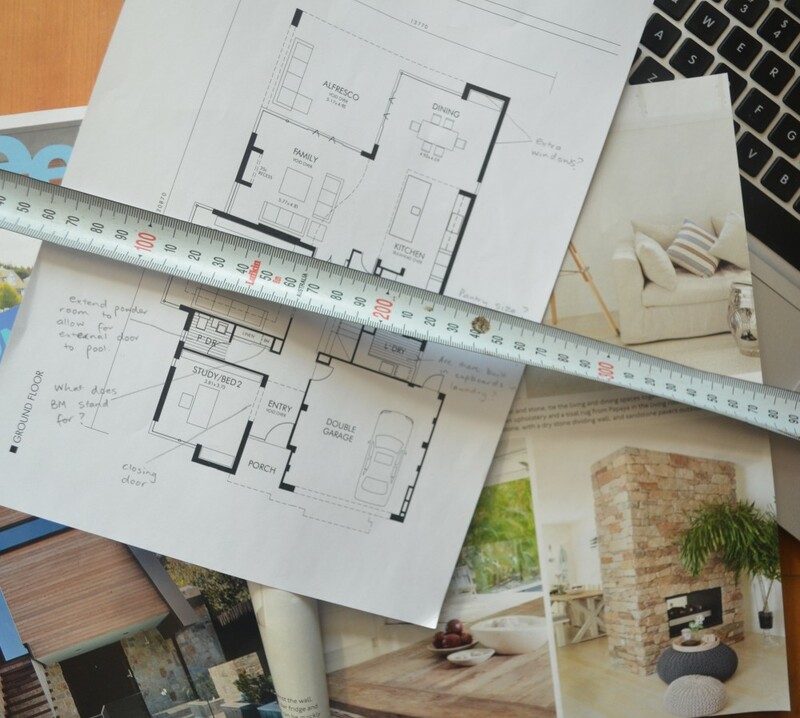 How do you deal with the emotional highs and lows of building or renovating?